Beautiful! Congrats. Let us know your impressions. Upon inspection I soon realized this was a a high quality telescope just from the packaging. Build quality of the Pentax 75 EDHF exceeded my expectations. The tube is much heavier than I thought. The tube is very solid and is of high quality. The beautifully painted and hammered green finish is really attractive and appealing to me. 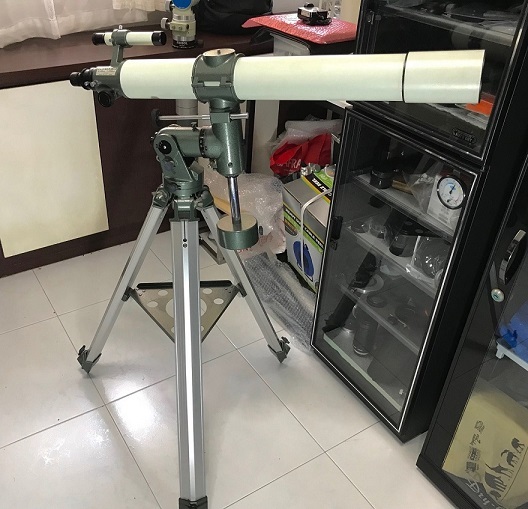 The precision of the machining and fit of all the components is obviously much better than most of the Chinese made telescopes out there. The front objective lens is pristine and the 7 layer multi-coating has struck me as high transmission with very little reflectivity using a bright white LED light. The rear field flattener is of equally nice quality. 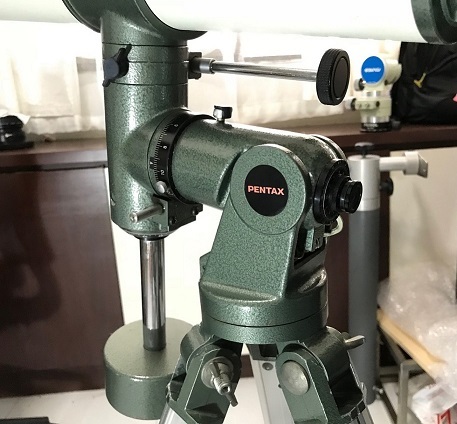 The Pentax MS-2 Equatorial mount is beautifully crafted and exudes quality. The spring loaded altitude adjustment was a unique feature and I was surprised to see it flip to the maximum altitude when releasing the altitude clamp. The tripod legs installed easily and each leg was solid. There was no slop in the construction of the tripod legs. The stability of the mount was further improved with the addition of the metal tripod spreader. The equatorial CW shaft is chrome plated steel and is machined beautifully. The whole thing assembled in a couple of minutes and then I proceeded to mount the OTA. With the OTA mounted I installed the RA shaft knob and checked the slow motion knobs. It was a little stiffer than expected but I realized there was also NO slop in the mount. Just accurate movements. The RA/DEC axis felt the same and slow motion movements were precise and had a great feedback feel to them. The azimuth adjustment was equally as smooth. The focuser is very smooth for a rack and pinion and I feel that locking clamp works very well. 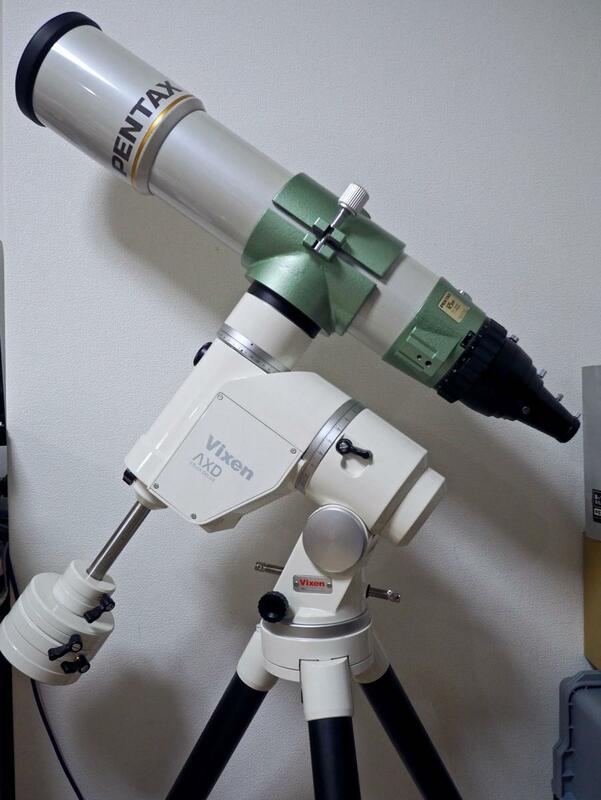 The 2.5" focuser is quite large on the telescope and it reminds me a lot of Takahashi R&P focusers. The variety of adapters is unique and I feel that I am going to have an interesting time getting my DSLR to adapt to the scope. 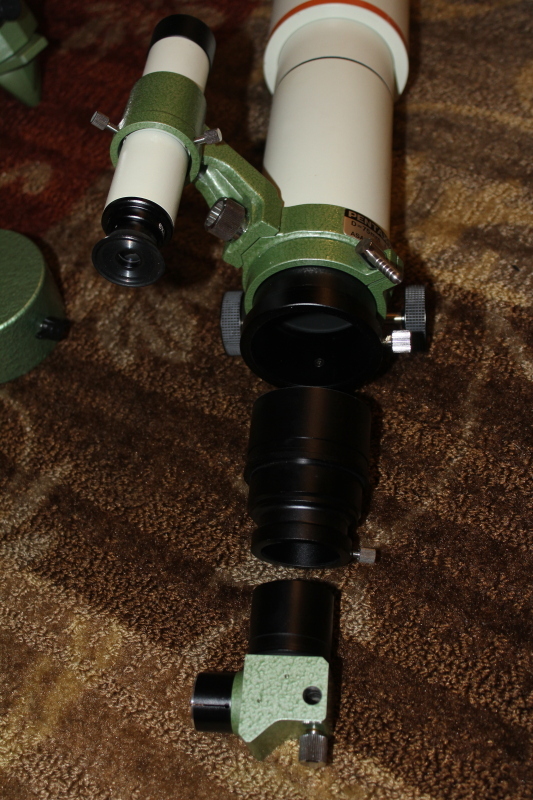 I took the assembled scope outside from my basement to the driveway and was surprised how portable the scope is. It is neither light nor heavy, but it definitely is compact. The solid feel of the mount made me confident I could transport it safely outside in one go, without disassembly. 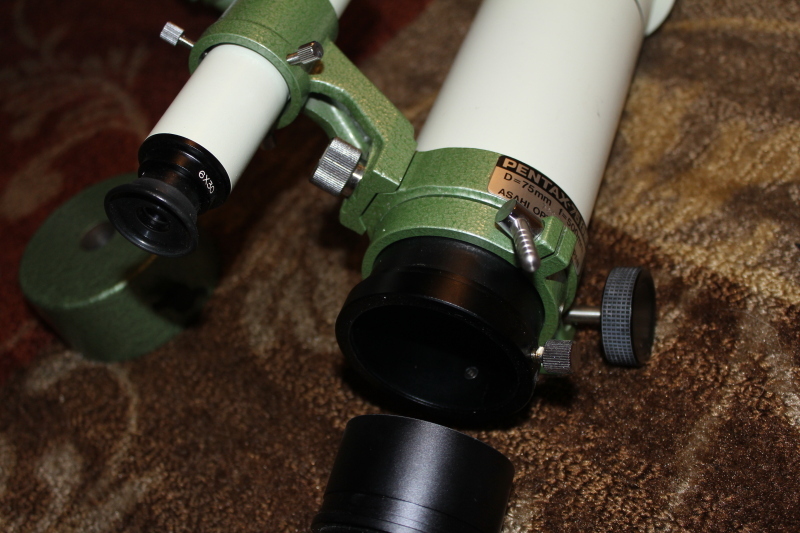 I polar aligned the mount to Polaris. It is a bit tricky to view the polar scope because of the awkward position being low to the ground. The optics in the little polar scope is very clear and focused nicely on Polaris. 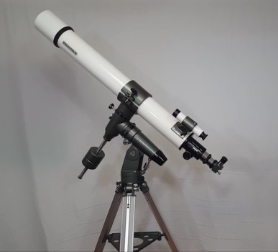 With the scope/CW attached, the spring loaded altitude adjustment was well balanced with the mount and adjustment was quite easy. Azimuth adjustment was even easier for accurate polar alignment. The 6x30 finder is a thing of beauty. The optical and build quality is very impressive and maybe equally good as some Takahashi finder scopes I have used. I pointed the scope towards Saturn and was greeted with a nice large round disc. 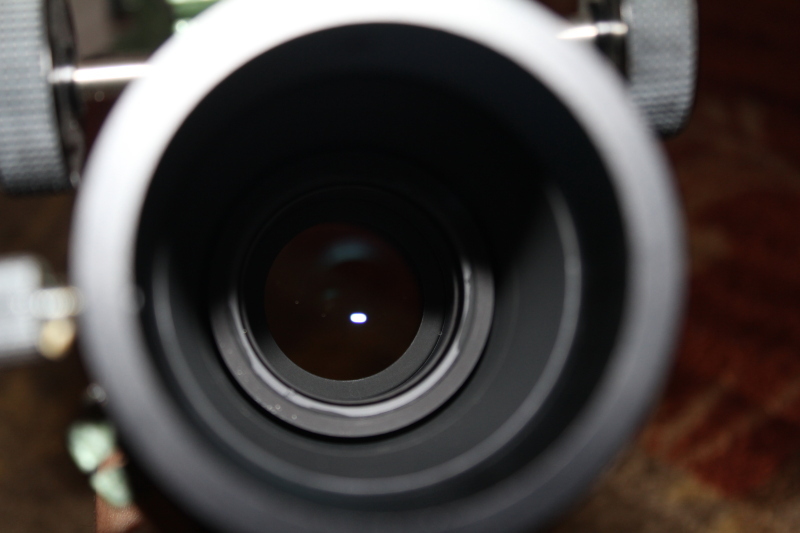 After focusing, a small oval appeared with the Pentax Kellner 20mm eyepiece. With the 6mm Pentax Orthoscopic inserted, Saturn revealed its rings and showed quite a bit of detail. I was looking for any Chromatic abberation and couldnt not detect any. I was very suprised how much detail I could pull out with such a small scope. Next was the moon. With the 6mm still in the moon was very bright and impressive. I detected a small amount of green/yellow CA on the limbs of the moon, but nothing to complain about. Next was Vega. The 75 showed a very small blue halo around the star in focus and I proceeded to rack the focus in and out to do a star test. The outside focus was sharp and rings clearly defined. It had some green/yellow tinge to it. Inside of focus the round disc was less defined and also had some color to it. Going back to focus the star "snapped" into place and the airy disc was clearly seen. There was no elongation of the star inside/outside of focus- indication no astigmatism in the system. I would say the star test revealed a small bit of overcorrection but I would rate this as one of my better star tests I have performed on many telescopes. The Pentax 75EDHF seems to have the same amount of CA as an AT102ED I once owned (from memory). The optics are superb and I suspect the ED element is an FPL-51 or similar. I believe Pentax made the SDHF using FPL-53 ED glass for even better CA correction. The build quality is nearly the quality as Takahashi refractors I have used. I would say nearly because Takahashi uses metal knobs for the focuser instead of plastic knobs. The hardware used and the machining tolerances is definetly up there with Takahashi. With a 30mm image circle, I can't wait to try out Pentax 75EDHF flat field astrograph with my DSLR . I will have to mount the OTA on my tracking mount, since the MS-2 mount has no RA drive motor. I am very lucky to find a pristine Pentax 75EDHF and this kit feels about as new as it comes! What a wonderful scope! Congratulations!! the 75 looks like new in a box, what a great find, congrats ! I have had my Pentax MS-5 GEM for nearly thirty years. When I first looked at the Mount forum on CN people were talking about "slop", "backlash" and even the need to "mesh the geers" on an AP 1100. I had no idea what those things were and what these people were talking about. None of these problems existed on my perfectly machined Pentax GEM. There is no slop, no backlash and I do not even know what it means to mesh the geers. Guys, What is a 100, F12 (achromat, not ED) with complete with mount and a eyepieces and a couple of diagonals worh in todays market? Hard to say - they don't come up for sale very often. 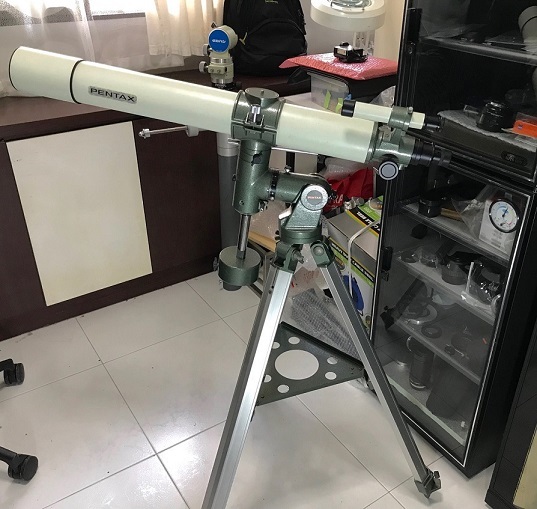 I searched Amart and couldn't find anything (there is an ED version that went for $1800 back in 2009, but this would be a less expensive scope since it is an achromat). Owning one with mount and pier and aluminum tripod and complete set of eyepieces and .965 and 1.25 diagonals and two Pentax barlows and RA drive, and knowing the images mine provides, and comparing with Unitrons and Gotos as far as kit and fit and finish and $10k Nikon 10cm out there, I would suggest about $3500. Mine is not for sale, but I had and sold the Uniton 4" and I would sell the Goto for quite a bit more, but again it's not for sale either. I'm happy and sad to see this topic.....happy that it's a Pentax thread, but sad to see that it's been categorised as "Classic"!! Looks pretty darn 'Classic' to me. Very nice scope. Thanks for posting. Well this SDP is certainly much newer than the EDHF series. 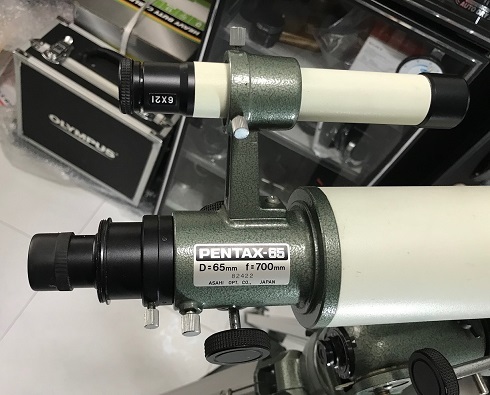 Since Pentax no longer makes telescopes and approaching 10 year since production, its safe to say Pentax telescopes are classics! I have a Pentax 75 SDHF that I bought as a package with a full set of Pentax SMC Orthos. It's nice and sharp, with just a little false color. For years I kept a white light solar filter on it for quick looks at the sun, with the scope mounted on an altazimuth head and tripod. 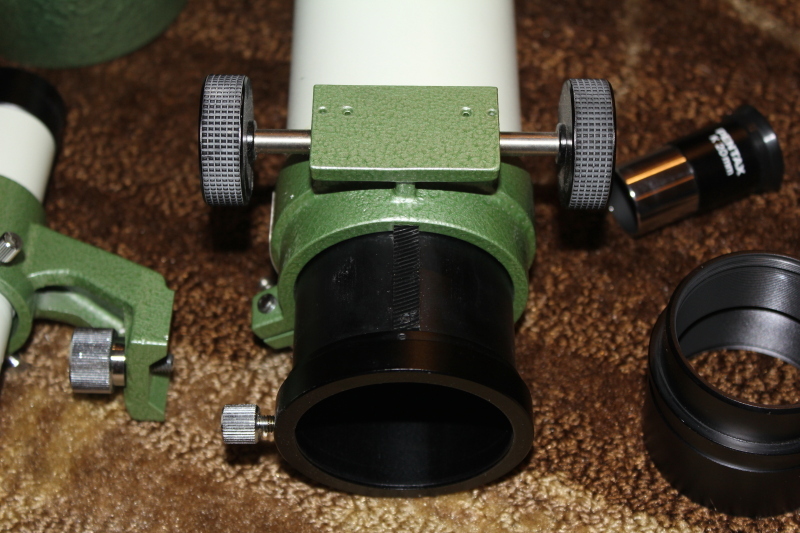 When I finally put it on an equatorial mount, I found it had an essentially perfect star test. 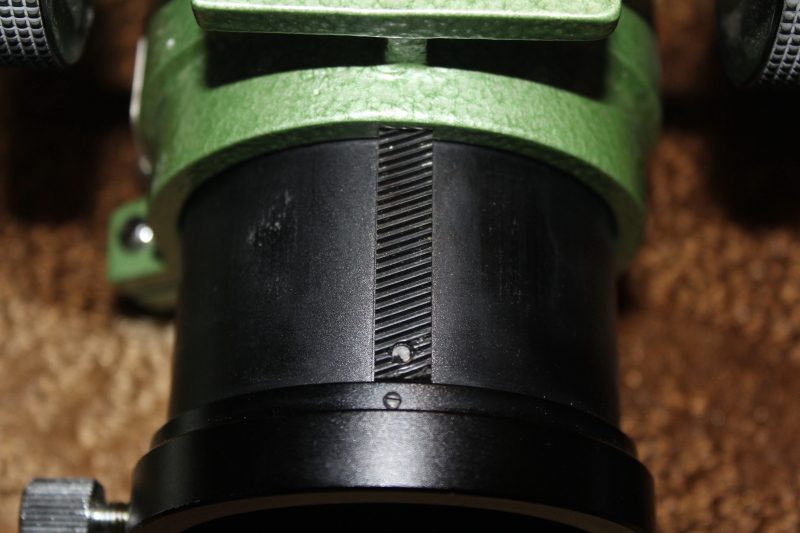 Another nice feature is that it has a flat field without the need for a reducer or flattener. At 500mm, it could be ideal for solar eclipses, either for photography or visual use. I'd like to find a proper Pentax mount and tripod for it some day, maybe the model one up from what it normally uses. I have owned 2 Pentax telescopes in the past. I owned a Pentax 85 achro and mount in the 80's. In fact the late Bruce of Company 7 and I had ours both at the same time. I used it to see the impacts in the cloud surface of Jupiter when Shoemaker-Levy hit. In the 90's I acquired a Pentax 75EDHF OTA and used it to make a travel rig using a Nihon Seiko portable EQ mount. Views of Omega Centauri from the Bahamas will last a lifetime. I have used and collected Pentax cameras off and on for 45+ years. I still have the complete set of Pentax XL eyepieces I acquired while working for Gary Hand. Edited by ginnz, 09 December 2017 - 11:17 PM. I got to own Pentax-65 (D65mm F700) comes with MS-2 manual EQ mount. Since it is non ED scope, I expected some amount of CA but didn't notice CA when viewed Moon & Jupiter. Both scope and mount built quality is superb, solid and smooth with vintage charms. Only flaw I noticed is plastic capped knobs for RA & DEC tension adjustment easily crack due to age. But it is not an issue since it can be easily replaced with machined metal knobs. I am sure every owner will love it and won't regret to spend money to own Pentax. Yes, I think I will love it! I look forward to making it an exhibit in my Classic Telescope Video Museum so a lot of other vintage scope fans will get to see it as well. Oh I saw that video long ago and was wondering where you did you get 85mm Pentax scope! I didn't realize proud owner is you. Congrats Dave, you own two beautiful scopes with superb mounts. My Pentax 85 is from 1978 and the 65 is from 1982... according to an expert who would know. I think you are right, the first two digits are the year. Yes, the 85 is from a friend who lives near me and used to be a Pentax rep. Apparently these scopes are pretty rare in the US.